It is a given that our Airstream was always a bit of a lone ranger at the state parks and RV resorts we stayed in. Dwarfed by Class A’s and Fifth Wheels, our Silver Bullet gleamed in the sun and was a bird without a flock. When we met Susan and Bob at the picnic area back in east Texas, they had asked if we had ever stayed in an Airstream-only park. The idea had floated in the backs of our minds, but their question turned the thought into action. So, here we were traveling along the narrow highways of western Virginia. The pronounced hills and valleys lifted, twisted and dropped the road we were traveling. We knew Airstreams had mastered this obstacle course before us, but it was still a bit of a nail biter. The Virginia Highland Haven Airstream Park sits atop one of the most gorgeous hills in the landscape. Pulling into the park is to enter another world. Spread out in all directions are views across other valleys and mountains. The wind blows through the trees and across the grass. Every sunset is different and as equally breathtaking as the last. Like other Airsteam-only parks, Highland Haven is a cooperative. There are 46 campsites in the park and 46 shareholders. The park is open from May 1-October 15. The shareholders can stay the entire season or just drop in for a week or two. In any case, shareholders share the workload of park maintenance and all are expected to pitch in. When shareholders are not on site, guests can stay on the empty sites providing a revenue stream. We pulled into the park and up to the Camp Host’s site. Robert was on duty this week—shareholders must act as host at least one week each season. Robert was very friendly and directed us to our site. A line of beautiful Airstreams extended the length of the road along the hilltop. 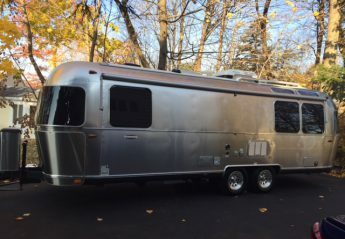 The Airstreams—of all vintages—gleamed in the sun. The sites were gravel and quite narrow. Having long since abandoned the feeling of performance anxiety at a state park or RV resort, it returned now. Somehow we felt a little intimidated at being in this society of fellow Airstreamers. Nevertheless, Jim negotiated the narrow site skillfully and we got ourselves set up. The wind was blowing steadily and the sun was warm. We walked down to the clubhouse to poke around a bit. The club house was formerly a home and offered communal living areas, a very nice enclosed front porch, the kitchen and a laundry area. It was all comfortably worn and very neat and tidy. We talked with one of the shareholders who was preparing homemade ice cream for the evenings ice cream and brownie get together. He urged us to join them. This was a welcoming community. Back at our site, we settled into our chairs and looked out across the landscape of mountains and valleys. We weren’t quite ready for the brownie social, but each passerby waved and we returned the greeting. We watched the sun set in a brilliant fire that burned the edges of the clouds and reflected off the shiny aluminum shells of the Airstreams standing in a row. Somehow beyond staying in a park full of Airstreams, we had no agenda or itinerary for what we would do the three nights and two days at Highland Haven. The ice cream chef had mentioned Floyd as a possible destination. I was also very interested in retracing our steps to Christiansburg where I had seen an antiques store which called to me. We set off across the roller coaster roads to Floyd. Floyd may have a one syllable name and only one traffic light, but it was a delightful surprise. Here in the middle of rural Virginia was a little hotbed of artisans, music and culture. We parked and wandered around the shops. The hardware store was both picturesque and bursting with anything one might possibly need. We wandered along poking into stores which seemed intriguing. The yarn shop was closed which was probably just as well. There were multiple establishments offering live music. The community park was under renovation and looked like it would be a lovely garden spot when done. The old railroad depot had been transformed to host the weekly farmer’s market. Hanging from the raftered ceiling were banners from local establishments and craftsmen. Jim’s eye was caught by one for the Five Mile Mountain Distillery. My Google app said it was only 1.1 miles down the road. The Five Mile Mountain Distillery perched itself over the road leading south out of town. The steep drive led to a small gravel parking lot. The building itself was a quirky blend of mill and factory. We stepped across the wooden porch and entered to be greeted by a very great Great Dane. A young man with an impressive red curly beard greeted us. He was co-owner of the distillery. We never did get our host’s name (a holdover from the illicit past? ), but we enjoyed his passionate history of the distillery and how he came to be a purveyor of moonshine whiskey. He grew up locally and the hills around Floyd were filled with stills. He learned from the old masters who had kept the country fueled during Prohibition. After years in construction, he had cast about for a next career. By chance he heard of someone else planning to open a distillery in Floyd and, figuring the town wasn’t big enough for the both of them, they joined forces. A spirit of cooperation sadly often lacking. The tasting room was an attractive meld of wood and copper dominated by the bar and on the far wall, display shelves which featured a trio of old stills. The building had formerly been part of the water works for the town before it was abandoned. Our host related the process of renovation from a dilapidated home for black snakes to the attractive venue we were now in. We tasted thimblefuls of the moonshine on offer. The Vanilla Plum had a warmth of plum followed by a touch of the vanilla. The Elderberry was a gorgeous deep color and much more astringent than I had expected. The Sweet Mountain Moonshine was 100 proof and exploded with warmth in our mouths. I was unable to finish even the thimbleful I had been given of the 100 proof. One of the old stills on display had been given to our host by an old moonshiner now 93. He had walked the fields with him one day. The old guy would come to a gate, kick around in the dirt a bit and come up with a jar. After a sip, he would replace the jar and they would continue. At the next gate the ritual was repeated. During Prohibition this old fellow ran moonshine up to the mines in West Virginia. He would sell his load and head over to the company-owned store. They would load him up with sugar out the back door and he would head back to distill another load of clear thunder. After a long and enjoyable conversation, we learned that the Tasting Room wasn’t even open that day. Our host was just so passionate, he was happy to share his enthusiasm. They were there distilling moonshine and building their business. We left with some of their inventory in hand. The drive to Christiansburg was another half hour away. Back up and down the hills, twisting through the valleys. It was a heck of a lot easier without a trailer in tow, but tiring for Jim nonetheless. I left him dozing in the truck while I headed in to the antiques shop. I never go to antiques stores, but something about this shop called to me. It was a large, labyrinthine affair crammed to the ceiling with antiques. I was on a special, secret mission about which I cannot write. I can only report I was very successful and left two happy proprietors in my wake. We returned to the Haven. It was very windy and the temperature was dipping down to the 40’s. We hung out in the trailer and watched downloaded episodes of NCIS. Our second and last full day was much warmer and the wind had dropped. We decided to test the laundry facilities. While the loads were drying we walked along the country road past the fields of timothy hay. They had just cut one of the fields and it smelled sweet in the warm air. After lunch we headed back to Floyd. Ostensibly, we were after some groceries and diesel, but there was most likely an ulterior motive as well. A couple of shops had been closed the day before and we were interested in checking them out. Jim scored a devilishly handsome hat and I found some birthday presents for both Ellie and Peter. For once we were avoiding the monotony of the big box stores which seem to dominate our urban areas. These little shops supported local artisans. Our list of five items including groceries and diesel was soon checked off and we headed back to Highland Haven. That evening two shareholders were hosting a chili and cornbread dinner. We had signed up before heading to town. Just before six, couples began heading down the park road to the club house and we joined them. Everyone was most welcoming. After a brief grace, Robert, the week’s host, asked the guests to introduce themselves. There were six couples visiting from Quebec, South Carolina, Texas, Massachusetts and, of course, Connecticut. The chili and cornbread were good accompanied by a tossed salad and happy chatter. By chance (I swear), I had worn my USMC t-shirt and we ended up seated with our next door neighbor, a retired Marine who fought in Viet Nam. Always happy to talk about Alex and the Marines, dinner was enjoyable. The highlight was Banana Pudding. Everyone was most amazed that these two Yankees had never had banana pudding. I will definitely add it to my new repertoire of southern cooking. I asked after the recipe and it was, of course, from that doyenne of southern cooking, Paula Deen. That night featured another brilliant sunset. We sat under our awning, wine in hand and watched a completely different show put on by the setting sun. The bittersweet realization that we were now in our last week of the trip was tempered by the beauty of the evening.